Swimming Pool Loan | Pool Financing | Palo Cedro Pool & Spa, Inc.
Lyon Financial’s many swimming pool financing options are exclusively tailored. They have outlasted others because of outstanding service and pride in serving customers nationwide. Getting financing for your new pool is never a hassle at Lyon Financial. Their representatives are always available to assist throughout the process, from start to finish. When you call, you will reach a real live person each and every time; someone at the ready to provide an immediate response to questions or concerns. Fixed rates and no prepayment penalties mean that getting your own pool is easier and more affordable. Lyon Financial offers a variety of pool loan financing options with a typical turnaround time that ranges between 24 and 48 hours. They have basically simplified the process from qualification to approval. Lyon’s commitment to service is what sets them apart. To add a touch of luxury to your lifestyle all you need is a team of experts with the experience to provide the information you require to make an informed decision. Call 877-754-5966 to find a program that best fits your unique needs. 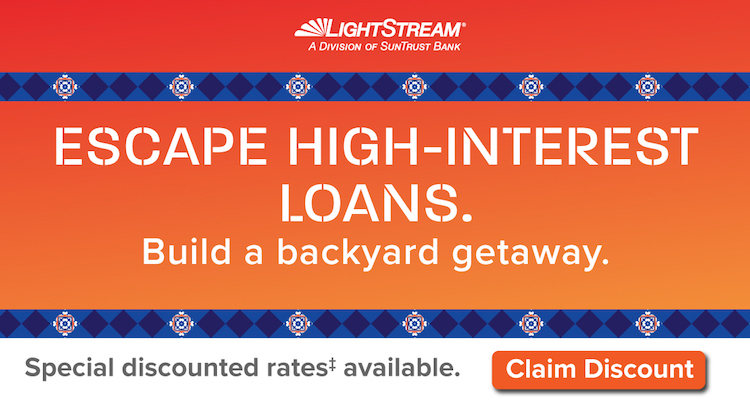 SwimmingPool.com and LightStream have teamed up to offer customers with good credit an unsecured consumer loan for all their pool and landscape needs. Whether you are looking for pool design inspiration, ideas for your perfect backyard, or the latest in swimming pool trends, SwimmingPool.com is your ultimate resource! Special .25% APR discount‡ through SwimmingPool.com!